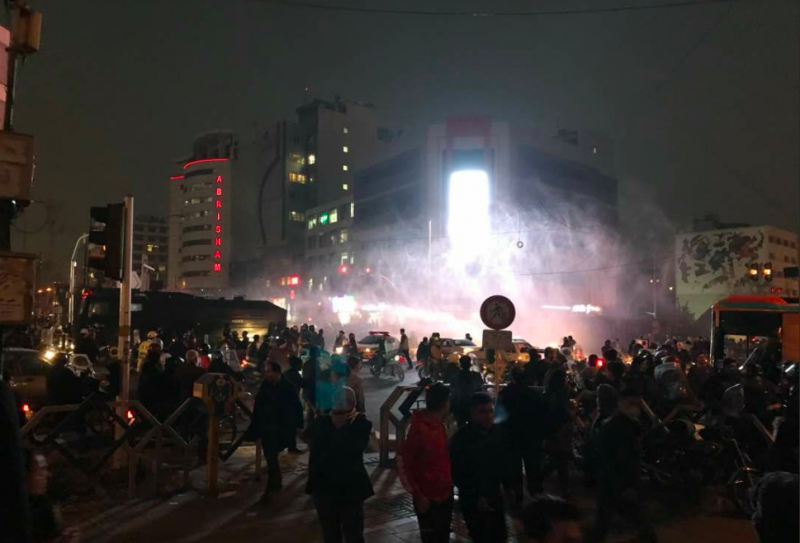 Iranians gathered in protests in Tehran's Ferdowsi square disperse after police start water jets. Image from Iran Newspaper, shared with the intention to distribute. The original version of this article first appeared on the website for Center for Human Rights in Iran. This version is published here as part of a content-sharing agreement. For the first time since the mass protests of 2009, the Islamic Republic of Iran has imposed severe restrictions on internet access, curbing the distribution of images, videos and reports about the nationwide protests that began on December 28, 2017. 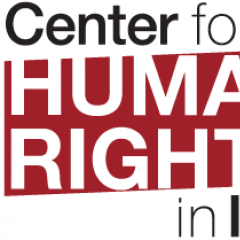 The Center for Human Rights in Iran (CHRI) has learned that internet access in Iran was severely disrupted on December 30 and at one point completely cut off for half an hour. A day later, Telegram and Instagram, two of the country’s most widely used social media applications, were blocked. “We have been ordered to interrupt international traffic,” a source at an Iranian internet exchange point (IXP) told CHRI on December 31. The source requested anonymity for security reasons. An internet exchange point is the physical infrastructure through which internet service providers (ISPs) exchange internet traffic between networks. Without this technology in place, it is difficult for internet users to access websites hosted in other countries. “Every other international data packet is being bumped off the network, which creates widespread disruption,” said the source. On December 28, reformist news site Jame Farda reported that the decision was made by the Supreme National Security Council, which is heavily influenced by Supreme Leader Ali Khamenei, who appoints the council’s individual members. “In response to a question from our IT reporter about the authority behind the recent filtering, Telecommunications Minister [Mohammad Javad] Azari Jahromi said the decision was made by the Supreme National Security Council and is temporary,” said the report. On January 1, 2018, users who tried to access sites with servers based outside Iran found themselves blocked from going online for 30 minutes. While that restriction has been removed, internet users are still facing extreme difficulties trying to access foreign websites. Circumvention tools such as virtual private networks (VPNs), which enable users to bypass state filters, are also faltering, with many working for just 10 minutes and then suddenly breaking down. Tor, a free software that enables users to access the internet anonymously—one of the few foreign sites still accessible by Iranians—reported up to 10,000 direct connections from Iran on January 2, a number well above Iran's average of 6,000 connections. While connections to foreign websites have ranged from difficult to impossible to reach, domestic traffic on Iran's National Information Network (NIN) experienced no disruptions. Iran launched the first phase of its domestic internet in 2016. The NIN, which divides internet traffic into the categories of foreign and domestic, was created to encourage citizens to access state-approved domestic sites by offering lower usage prices and faster speeds. In a total infringement of the rights of access to information and internet access, the NIN also gives the state the power to interrupt or block access to the worldwide web and direct all traffic to domestic destinations. Over the past week, users have reported no problems accessing the supreme leader’s official website, www.khamenei.ir, and state-funded news outlets like the Iranian Students News Agency. But users who tried to access websites and apps with servers based outside Iran, like Wikipedia or Instagram, were not so lucky. When the internet was cut off in 2009 to block people from uploading images of protests against the outcome of that year’s presidential election, few relied on the network for business. This time it has affected the operations and revenues of many online firms. Some Iranians who were able to access their Twitter accounts this past week posted complaints about the difficulties of getting online. It’s terrible. Websites hardly open. Most circumvention tools have stopped functioning and those that work are very slow. Only domestic sites open fast. “For the past few minutes my connection with [ISP] Asiatech only lets me open domestic sites. I tweeted this with my Irancell account,” tweeted Behrouz Khezry. My Asiatech account also cuts off and only open Iranian sites. After a few kicks and punches, I was only able to connect with Lantern [VPN]. Also, no connections possible with Psiphon or Hotspot [VPNs]. Hamrahe Aval and Irancell connections are completely cut off. Pars Online’s ADSL service cuts off intermittently. It opens some domestic sites but not Google, for example. The only circumvention tool that barely worked was Psiphon. Tor did not work either. Until a few moments ago my circumvention tool was not working on my mobile. Also I could not open sites like Google and Yahoo with my home internet. But I could open Digikala and Parsijoo. Is this the national internet? The disruption affected people using a number of Iran-based internet service providers, including Irancell, Sepanta, and Datak. However, the latest version of the channel, renamed as Sedaie Mardom [People’s Voice], has received Telegram’s approval and is now online. On January 1, many people in Iran received a message from Twitter asking them to change their passwords. It is not clear what prompted the message. Nevertheless, many Iranians were unable to reactivate their Twitter accounts after trying to change their passwords because Twitter validates users by sending them a code in a phone text message. However, due to US sanctions, Iran is not listed on Twitter’s phone country code menu, meaning that the app was unable to contact its Iranian users with the verification code. Since the rise of social media in Iran in 2009, hardliners in government have consistently cracked down on popular apps ahead of elections. The Rouhani administration has repeatedly called for less governmental control over the internet, which is heavily restricted and censored in Iran but has been silent on the disruption of the internet during the protests of 2017. In 2009, fewer people in Iran relied on the internet for their business operations, so when the government cut off internet access that year after hundreds of thousands took to the streets to dispute the result of that year’s election, companies weren’t as negatively impacted as they were in December 2017. Compared to previous occasions, this time the interruption in online services has adversely affected the livelihood of many people, including 150,000 taxi drivers in Tehran. Some 53 percent of Iran’s 80 million people had access to the internet in 2016, according to the UN’s International Telecommunication Union (ITU). The development of the internet was one of the most important reasons I voted for Hassan Rouhani. I may not be sorry for voting for him for economic reasons, but I sure am for not preventing the blocking of the internet.